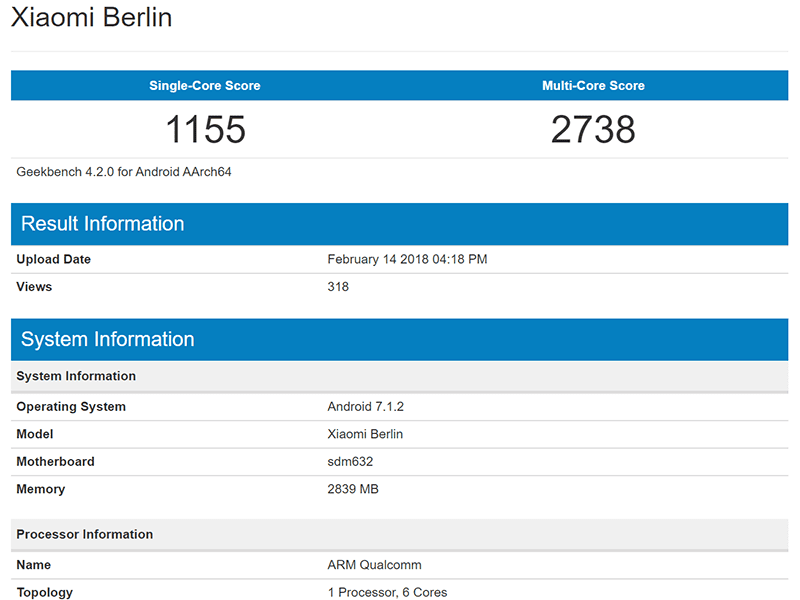 Xiaomi has a new smartphone with the codename "Berlin" was recently spotted on Geekbench's website. Based on the listing, the Xiaomi "Berlin" will be powered by the unannounced 64-bit Snapdragon 632 chip, a possible "hexa-core" mobile processor with 1.02GHz base frequency speed. Geekbench also revealed that it has a single-core score of 1155 and multi-core score of 2738. Those scores suggests that the "Berlin" is a mid-range Android smartphone. It is also coupled with 3GB RAM and will run with Android 7.1.2 Nougat OS. Other details about the display, graphics, storage, camera, battery, and other features are still unknown for now. Most likely, this handset will feature the new 18:9 screen aspect ratio standard. It could be launched alongside the upcoming Mi MIX 2S on March 27, 2018.